It’s pretty typical for artists to sign their work. What isn’t so typical is signing it atop a ladder, 18 feet in the air. Artist Augie WK has just put that finishing touch on his mural in Watsonville, which has attracted a lot of attention since being completed earlier this month. The mural on the side of Don Rafa’s Supermercado near the corner of Main and Riverside avenues is big — 21 feet high and more than 60 feet long, WK figures — and brilliantly colored. If you’re traveling along Riverside on your way to Highway 1, it’s hard to miss. The mural features the Spanish word “Sabor” in a curvy font against a backdrop of layered lines that bring to mind a Mexican serape. Sabor means flavor, which seems like it could be a reference to what’s inside the market. But it’s much more than that. There are other layers of meaning: It’s also a reference to personal style and how someone lives their life. WK, raised in Salinas, studied art at Hartnell College and had painted other public art before, including several utility boxes as part of the Salinas Urban Art Project. Then he set his sights on doing something bigger and moved to Watsonville, since that gave him access to Santa Cruz County arts grants. 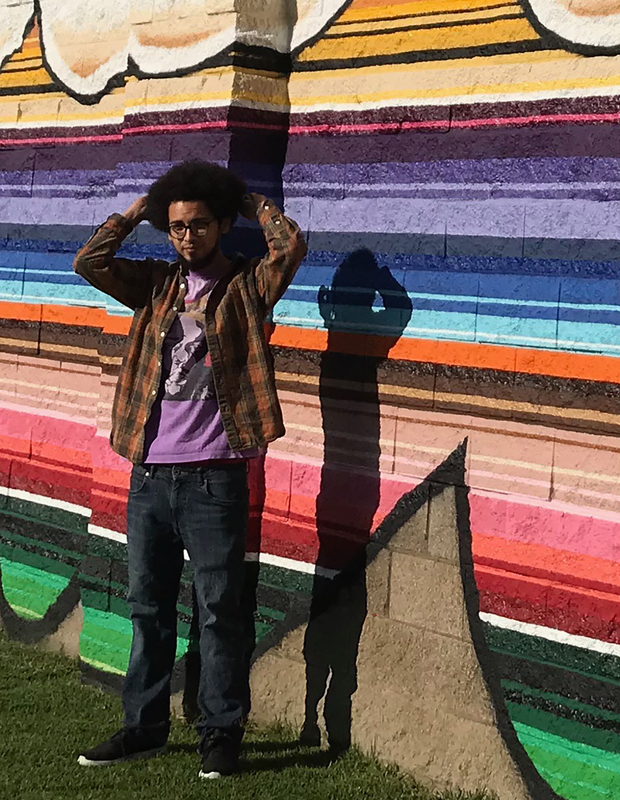 He designed and painted the mural in collaboration with his girlfriend, Jessica Carmen, over the past five months, while also working a five-day-a-week job in Santa Cruz and creating other kinds of art whenever he can. Completing a large mural in that amount of time with only two people — and during the rainy season, yet — seems like an astonishing, lightning-quick feat of artistic will. Not only that, but WK had to fight the powers that be just to get it done. He had obtained a grant last July from the Arts Council of Santa Cruz and received enthusiastic permission from the store’s owners to create the mural. He and Carmen checked the city of Watsonville’s website for guidance about local ordinances regarding mural creation, found nothing, and WK says repeated phone calls to the city for information were never returned. So after he and Carmen began painting, the city of Watsonville stepped in with a cease-and-desist order: The mural was too tall, too colorful, and besides, WK had not obtained the proper permit. Fees to submit the permit and for a public hearing would have cost almost $1,000, so in October, WK launched a GoFundMe page to raise the money. There was a flurry of social media shares, and it took just two days to raise the funds. But further negotiations with the city brought the fees down to a $180 signage fee, so now WK is using the additional money raised for extra paint to touch up the mural when necessary, and for waterproofing, which will make it resist graffiti. “Yeah, it was just two people doing this,” said WK, looking at his work. “I don’t trust just anyone to do these straight lines.” Also challenging was the rough, rocky surface that was the side of the building, which made doing straight lines that much tougher. The mural, even as it progressed, was a magnet for visitors and well-wishers. “People got used to seeing me here,” said WK, with regulars stopping by to check on it. The unveiling on Jan. 13 attracted more new fans, including high school students whose art teacher had suggested they check it out. Midway through the mural’s creation, WK said he realized there was yet another, more personal meaning to what sabor meant to him. Its lyrics relate how lovers carry each other’s essence for all time: … our souls got so close that now I carry your flavor, but you also carry mine. “It’s a really beautiful song,” said WK, recalling the song being played at her funeral. And that connection to his grandmother makes this project even more meaningful for him. Kathryn McKenzie grew up in Santa Cruz, worked for the Monterey Herald for 10 years, and now freelances for a variety of publications and websites.